Alolan Vulpix in game: 2,915 Who? Important notice! Pokemon Alolan Vulpix is a fictional character of humans. In Alola, Vulpix has a regional variant that is Ice-type. It evolves into Alolan Ninetales when exposed to an Ice Stone. Vulpix is a small, quadruped, fox-like Pokémon. It has red-brown pelt, brown, pupil-less eyes, large, pointed ears with dark brown insides, and six orange tails with curled tips. The tails grow hot as evolution approaches for this Pokémon. 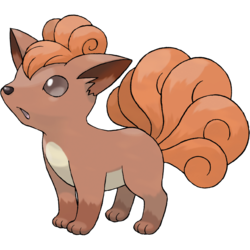 Vulpix also has curled locks of orange fur with bangs on top of its head. At birth, Vulpix has only one white tail, which apparently splits and grows more beautiful and warmer as it grows older. Vulpix has a cream underbelly, and brown feet with lighter brown paw pads. Vulpix has a flame inside its body that never goes out, and is capable of manipulating fire to such precision as to compose floating wisps of flame. When the temperature outside increases, it will expel flames from its mouths to prevent its body from overheating. Vulpix is known to feign injury to escape from opponents too powerful for it to defeat. 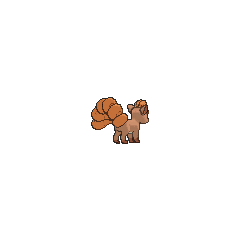 Vulpix can be found most commonly in grassy plains. In the Alola region, Vulpix has adapted to snowy mountain peaks. Its fur has become snowy white. It has pale blue paws, blue eyes, and dark blue insides its ears. 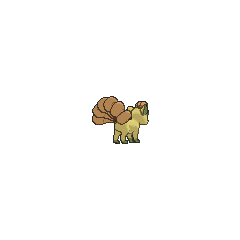 Its snout is more pronounced and pointed than that of non-Alolan Vulpix. The locks of hair on its head and its six tails are curlier with a wispy appearance. Alolan Vulpix is believed to have arrived in the region at the same time as humans, but moved to the snow-capped mountain to avoid other Pokémon. It can be found in small pack with two to five individuals. 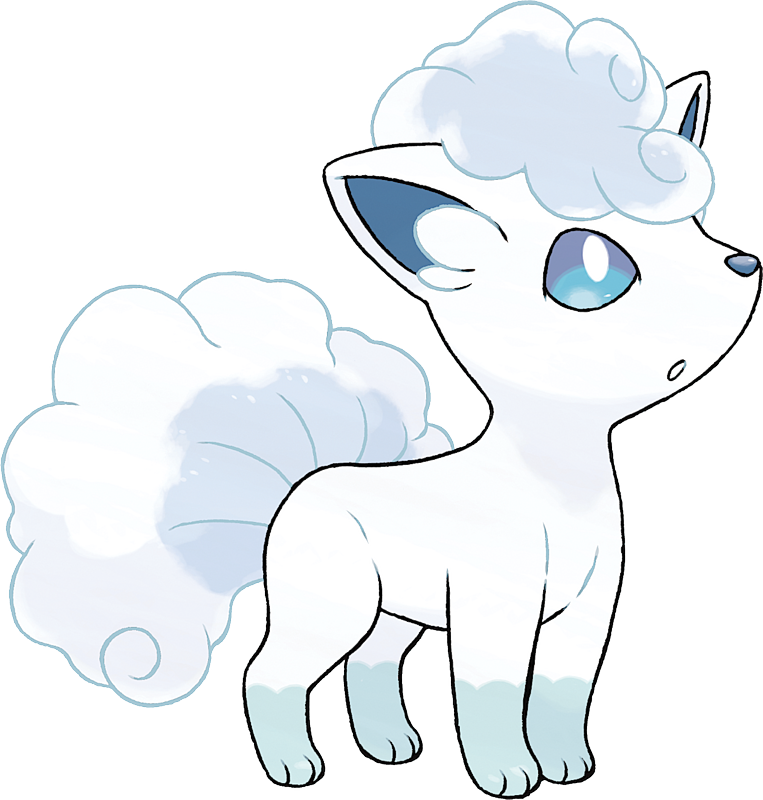 Alolan Vulpix can expel breath as cold as -58°F (-50°C), which is capable of freezing anything. While it is not suited to warmer environments, its tail can produce ice to lower the surrounding temperature if needed. According to the Pokédex, an older name for Alolan Vulpix is Keokeo. Brock had a Vulpix that he obtained from Suzie in Kanto in Pokémon Fashion Flash. In Beauty and the Breeder, he returned it to her. In Love, Pokémon Style, a Vulpix has been owned by Macy. In May's Egg-Cellent Adventure!, one hatched from an Egg. An Alolan Vulpix debuted in SM013, hatching from an Egg. 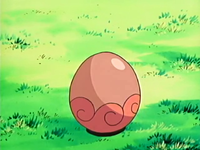 A Vulpix will appear in SM014, where it hatches from the egg that was given to Delia by Professor Oak to deliver the it to his cousin Samson Oak in Alola to New Adventure!. 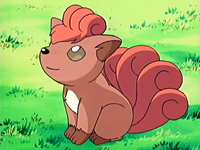 A Vulpix was among the Pokémon controlled by Cassidy and Butch in Pikachu Re-Volts. Ralph and Emily were both shown in a flashback to have once owned a Vulpix each in Wherefore Art Thou, Pokémon?. Vulpix also appeared in The Power of One. A Vulpix appeared in Pokémon Heroes: Latios & Latias under the ownership of an elderly woman. A Vulpix was seen alongside its Trainer in a Pokémon Center in You're a Star, Larvitar!. A Vulpix appeared in the opening of Jirachi: Wish Maker and Lucario and the Mystery of Mew. Multiple Vulpix appeared in the opening of Destiny Deoxys. A Vulpix belonging to a Pokémon Coordinator appeared in The Saffron Con. A Vulpix appeared in Staging a Heroes' Welcome! under the ownership of a Pokémon Coordinator competing in the Wallace Cup. A Coordinator's Vulpix appeared in Old Rivals, New Tricks! participating in the Sandalstraw Town Pokémon Contest. 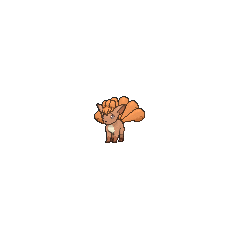 A Vulpix appeared in a fantasy in Mystery on a Deserted Island!. 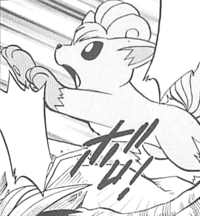 A Vulpix appeared in Ecruteak City in The Reawakening. Bill owns a Vulpix, which he uses as a guard for his house which first appeared in Hitmonlee, Baby! (One More Time). It again appeared with him at the Pokémon Association while he was talking about the Gym Leaders in Sunkern Treasure. In Slugging It Out With Slugma it appeared again with its Trainer when he was talking to Professor Oak, however it kept being a nuisance during the conversation along with Bill's Exeggcute. Flannery owns a Vulpix that first appeared in Bravo, Vibrava. She used to battle Angie's Ludicolo. Courtney's Ninetales was a Vulpix at one point, where it was used in Contests, shown in a flashback in It All Ends Now III. Vulpix can be seen as a parallel to Growlithe. Both are Generation I Pokémon that evolve once via a Fire Stone. Vulpix is exclusive to Pokémon Green, Blue, Silver, LeafGreen, and SoulSilver while Growlithe is to Red, Blue (Japan), Gold, FireRed, and HeartGold. 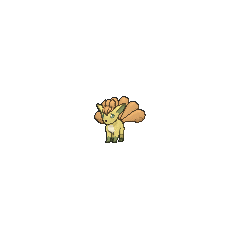 Growlithe has a 75% chance of being male while Vulpix has a 75% of being female, they are both in the Field Egg Group, can have Flash Fire as their Ability, and are yellow when Shiny from Generation III on. Furthermore, both are based on canines as well as animals of Japanese folklore: Vulpix from the fox and kitsune, Growlithe from the dog and shisa. Vulpix has the lowest base HP stat of all Fire-type Pokémon. Alolan Vulpix seems to be based on Arctic foxes.